Home English Vocabulary Congruent Definition. 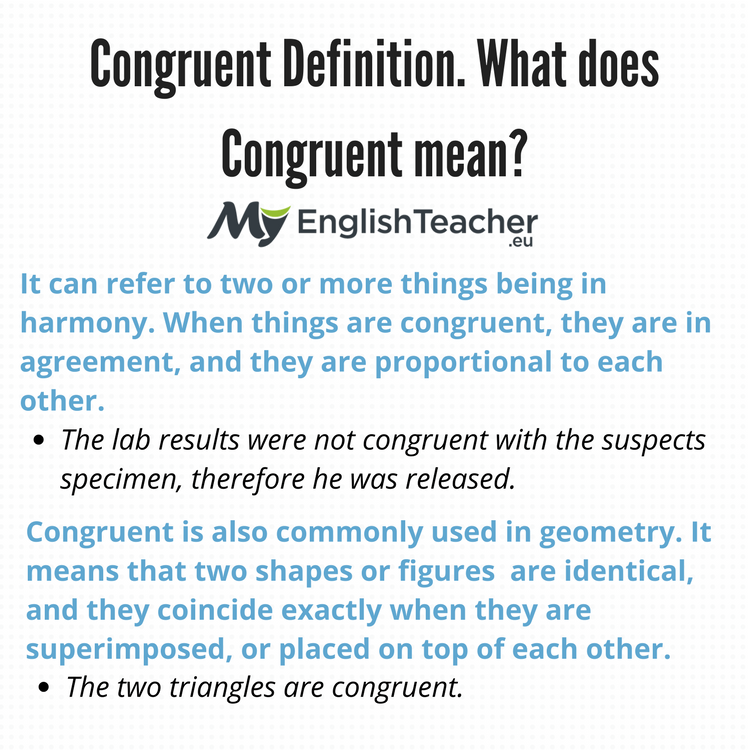 What does Congruent mean? Congruent has two meanings. It can refer to two or more things being in harmony. When things are congruent, they are in agreement, and they are proportional to each other. When things are congruent, it means that they are in peaceful consensus. Incentives and rewards are often spoken in these terms. The incentive for something should fit what a person is being asked to do. The incentive can be monetary or anything that the person being asked to do the task wants. For example a salary should be congruent with the work that someone is asked to do. Another example of something being congruent could be used to describe a friendship or other relationship. The two people’s political beliefs were not congruent. The lab results were not congruent with the suspects specimen, therefore he was released. Despite our differences we need to work together congruently. There are many synonyms for this definition of congruent. Here are some of the most popular. Accordant- means that two or more things are agreeing or compatible. It means that two things go together, or work well together. We need to find music that is accordant to the fight that is happening on the screen. After the investigation the police will determine if the evidence is in accordance to the witness statements. Congruous- means that two or more things are in agreement or are in harmony. Congruous can be used interchangeably with congruent. The quarterback and the receiver were not congruous, which resulted in an interception. The twins speech patterns and body language were congruous. Agreement – refers to two or more things or people being in harmony or accordance in their opinions or feelings . It can also refer to the result of two or more people or entities coming to an arrangement or agreeing to terms. The two companies were in agreement about how to move forward with the merger. Now that we settled the argument, are we in agreement. Harmonious- means that something is free from disagreement or dissent. It also refers to something that is pleasant. They have been together for 20 years, and they have a wonderfully harmonious relationship. After years of being harmonious, the two finally spoke their minds and an argument ensued. Incongruous- refers to something that is not harmonious, and does not keep with or match its surroundings. Essentially something that is incongruous does not belong. When she showed up in jeans and saw that everyone else was wearing ball gowns, she felt incongruous with her surroundings. The room was so beautiful, but the fake plant in the bathroom seemed incongruous with the elegance surrounding it. Inappropriate – refers to something or someone that is not proper or suitable for the circumstances. When something is inappropriate it may be right for another situation, but it is not right for the current situation that it’s in. The comment that she made at dinner was inappropriate considering she was meeting these people for the first time. What are you wearing tomorrow? I want to make sure I don’t wear something that is inappropriate. Congruent is also commonly used in geometry. It means that two shapes or figures are identical, and they coincide exactly when they are superimposed, or placed on top of each other. In simple terms it means that two things have the same size and shape. The two triangles are congruent. You can tell that the triangles are congruent because all three angles are the same. A regular polygon has eight congruent sides as well as eight congruent angles. There are a few synonyms for this definition of congruent. Here are some of the most popular. Conformity- means that something is in compliance with the rules. It can also mean that one’s behavior is in accordance with how things are supposed to be. Discipline and conformity with their values were two characteristics that the parents were looking for in a school. Conformity to the doctrine is required. Match- refers to people or things that resemble or correspond with each other. It’s very typical for twins to have matching outfits. Make sure the two fabrics match, please. Here is the most common antonym for this definition of congruent. Conflict- has many meanings, as an antonym to congruent it refers to an incompatibility amongst two or more ideas, interests, or things. Please make sure those colors aren’t in conflict with each other. I hope there isn’t a conflict at the meeting today. Previous articleConcede Meaning. What does Concede mean? Next articleCringe Definition. What does Cringe mean?